Mangaluru, Mar 19, 2018: Ugadi - the beginning of a New Year, here a new era for Konkani - March 18, Sunday, indeed a memorable day for the Konkani language and people. 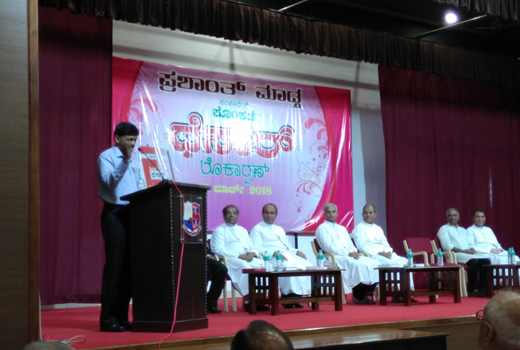 The ’Konkani Thesar’ the first ever Konkani Thesaurus, compiled and edited by a unique scholar personality of Mangaluru, Rev Prashant Madtha SJ, was launched at a simple but high profile event. 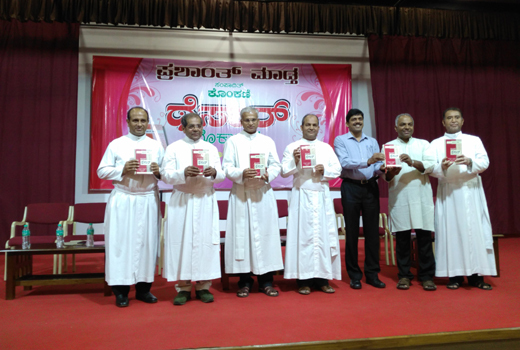 It contains thousands of synonyms and antonyms for about 5000 Konkani words, the third dictionary by Rev Prashant Madtha SJ., a columnist, a prolific writer in three languages- five books in Kannada, 4 books in Konkani, one in English titled, ‘On Eagle’s Wings’, recounting the history of St Aloysius College. 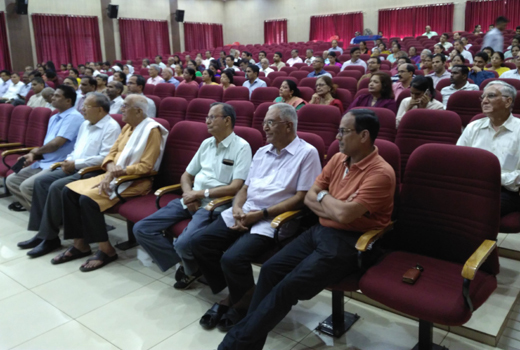 The well known konkani writer, CGS Taccode (Cyril Sequeira) welcomed the august gathering and was Master of Ceremonies, the event which was short and sweet, generated laughter all around. The sweet and dynamic language that is Konkani reaches out from the 41 clans that have used and developed it from time immemorial evolving from Prakrit, ancient Sanskrit to the modern version that has words incorporated unabashedly from many languages now used the world over. Signs are clear, the Konkani’s will not be overcome by alien influences that are becoming over powering, though Konkani has no script, it is written in 5 scripts of other languages. Scholars that can be named in a long recitation have contributed much, and rev Prashant Madtha is tall among them too.. this ’Konkani Thesaurus’ will serve to cater to and develop the written and active forms of Konkani...not only just now....but for future generations to come. The author compiler of the 600 page volume, Rev Prashant Madtha, a Jesuit of Karnataka, is a well known writer in both Konakani (with a pen name ’Valli Padraab’) and Kannada, he is known for the many first ranks he has taken and gold medals in his postgraduate career, a Kannada professor and principal of well known colleges. In spite of holding multiple responsibilities he has over the last many years put in additional 7 to 8 hours work for writing works of enduring need. He has bagged many awards and even ’India Today’ acclaimed him as one of the 50 pioneers of change in India, named him as the ‘wordsmith’, ‘Rogets of Kannada’. Speaking on the occasion he made all present to literally hold their sides with laughter. Though he externally seems stern, his words comforted all with the high end mirth...speaking in chaste Konkani, he said people have come to the event expecting a great elephant to deliver a great trophy (Gaja Prasava or ’hestheche Balnter’) but, see only a solid small volume. It reminds he said, of the famous book which was mis-titled ’How to change your wife’ instead of ’life’. He said to him it was an exhilarating feeling like a mother’s, after delivering a baby, who even though cursed and cried lots earlier, later says ’Savira Kodu Shivane’ - Lord give me thousand more! He said his thick volume of the earlier Konkani dictionary, he was assured by many, was being used well...then, one day he saw the children in a class using it to stand on to reach the blackboard - that’s how well books are often used. There is no need for a language to be ’Shudah’ pure, but it should be expressive and alive, with words from all sources and languages without shame. He said that though his advisers asked him print more copies he has kept the number fair and hoped all concerned will use it, with a special offer was available. 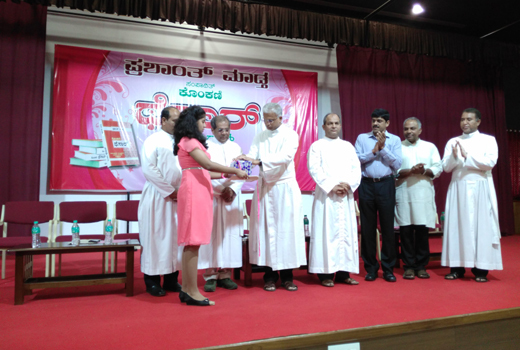 The book was officially unwrapped and released by St Joseph’s Institutions (Bengaluru) Rector Rev Antony Joseph SJ. 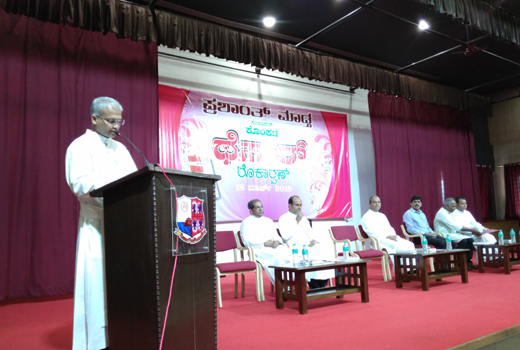 Speaking after releasing the book, he gave a deeper meaning of languages and the unique methodology envisioned, formulated and used by Rev Madtha in arranging the book which will put even ’Rogets Thesaurus’ in the shade. The provincial Rev. 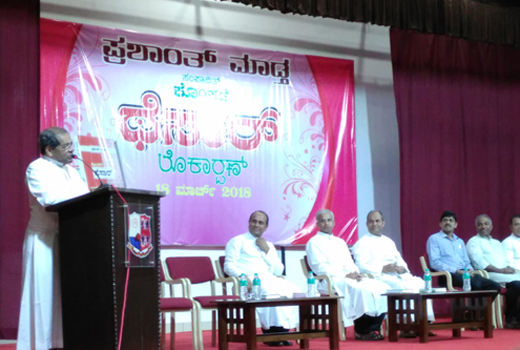 Stany D’Souza SJ spoke extolling the sweetness of Konkani and the contribution of Jesuits of Canara, and how the efforts of scholars like Rev Madtha have enriched it greatly. Dr. Anil Pinto, Registrarar, Christ University, Bangalore, made an indepth analysis and compared it to ’Roget’s Thesaurus’. 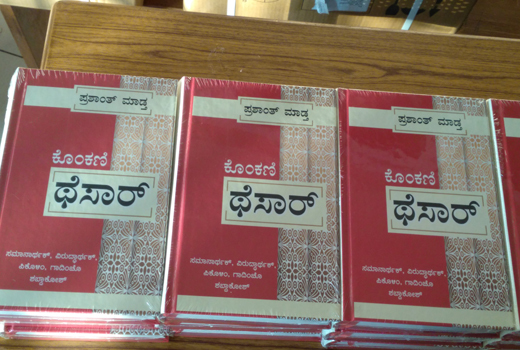 In 2008, the massive volume of Kannada synonyms and antonyms, ’Padanidhi’, a first of its kind in Kannada, was published, bringing Rev Madtha laurels. The method followed in this Konkani Thesaurus, is not in alphabetical order but conceptually arranged. With a good attendamce of litiratti of Mangaluru and surroundings, a few came also from overseas. Rev.Daniel Fernandes SJ, St.Joseph’s college of Commerce, Bangalore who has published the book, was on hand. Many Jesuits, priests, nuns and people were present on the occasion.